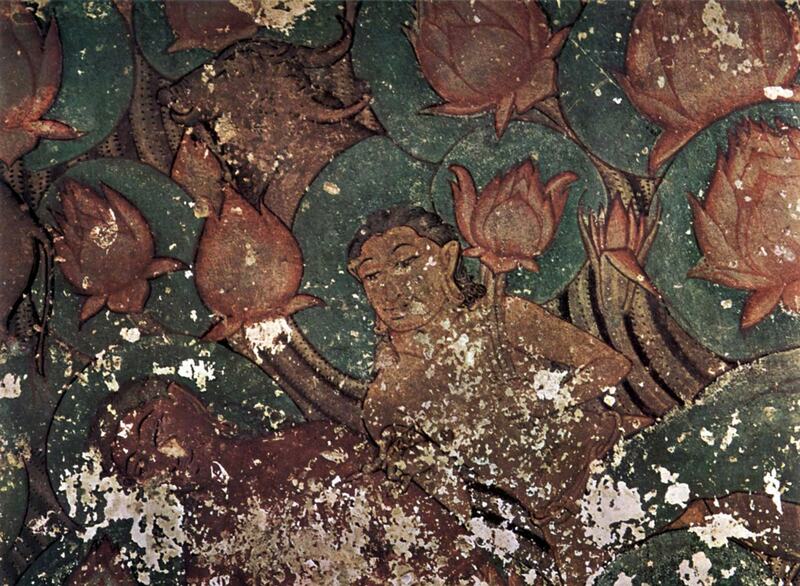 Some of the best cave paintings of medieval India are located in Sittanavasal Cave in Tamil Nadu. This rock-cut Jain monastery contains artwork comparable to famous murals in Ajanta Caves and Bagh Caves. Paintings were made in frescoe technique. Sittanavasal rock-cut cave is located on prominent rock which rises up to 70 m high over the surrounding plain. This site is very rich with exciting archaeological monuments. The name "Sittanavasal" has several explanations. One states that this is a distorted version of "chir-ran-nal-vaa-yil" meaning in Tamil language "the abode of great saints". Another states that this was a suburb of Annalvayil (chiru-annal-vaayil – "smaller Annalvayil". 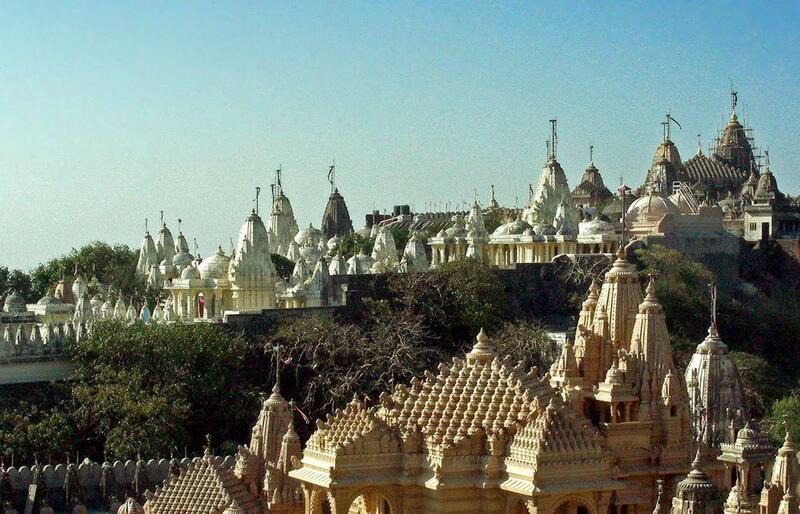 The painted rock-cut temple is a newcomer in the ancient Jain center of Sittanavasal. To the south, on the top of the hill, there is another, natural shelter which is known as Eladipattam (also Ezhadippattam). It served as a Jain shelter since the 1st century BC. Eladipattam got its name from seven holes cut in the rock – they serve as steps to ascend the shelter. Inside this cave, there are seventeen polished stone berths aligned into rows, each with a raised part – most likely these were beds for Jains with "stone pillows". The largest of these ascetic beds contains inscription in Brahmi script, Tamil language from the 1st century BC. Some more inscriptions in Tami language are from much later time – the 8th century AD. These inscriptions name mendicants – monks, for example – Tolakunrattu Kadavulan, Tirunillan, Tiruppuranan, Tittaicbaranan, Sri Purrnacandlan, Nityakaran Pattakali. Most likely these people spent their lives in isolation in this hill. Eladipattam served as a site of very severe penance – kayotsarga (meditation in standing posture until salvation) and sallekhana (fasting until death). Unfortunately most ancient inscriptions are covered with recent writings of vandals. 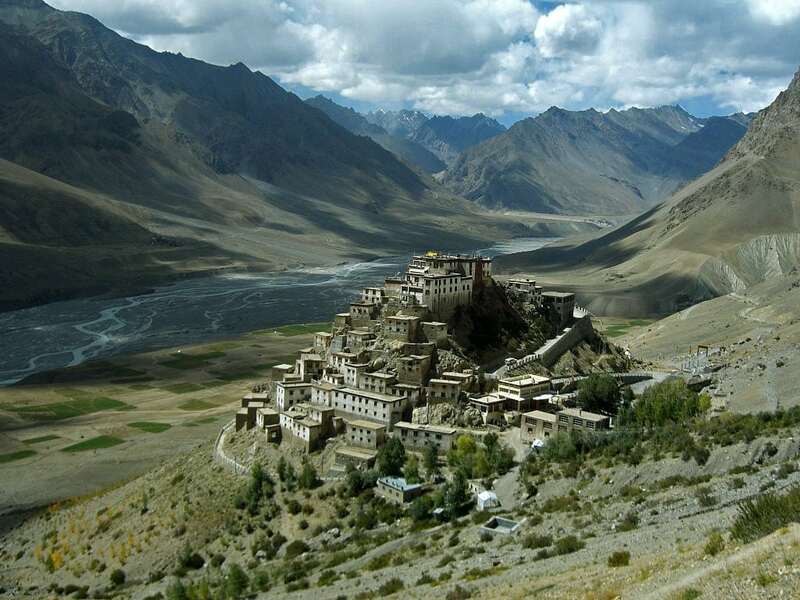 This stone shelter continued to be the "Holy Sramana Abode" until the 7th – 8th century AD. The famous paintings are located in later rock-cut temple named Arivar-Koil (temple of the Arhats) in north-western side of the rock. This temple has been cut in rock in the 7th – 9th c. AD. Facade of the temple is simple, with four rock-cut columns and one pilaster to the right. This construction is new, from the 20th century, built using the details from other monuments of architecture. Temple consists of forepart – and hall – ardha mandapam (Ardhamandapam) and a smaller cell – sanctum sanctorum (garbha griham) – at the rear wall. It seems that in Pandya times there was added also another forepart – mukha mandapam, which later collapsed. Forepart contains an inscription on the right side – Tamil inscription with 17 lines. It tells about Jain Ilan-Gautaman who repaired or renovated the ardha-mandapam during the reign of king Srimaran-Srivallabhan (815 – 862 AD). After several steps one passes by two columns and enters the ardha mandapam. It is 7 m wide and 2.3 m deep. The ceiling is approximately 2.6 m high. Left wall of this hall contains image of Parsvanatha (the 23rd Thirtankara), right wall – image of acharya – Jain teacher. At the rear wall, after several steps one reaches another chamber – garbha griham. Hall contains the main treasure of this monument – ancient paintings on ceilings and the top part of columns. Paintings are also on the ceiling of garbha griham. Originally the whole interior of the temple including the sculptures, was plastered and painted. Unfortunately the paintings on the walls have been lost. Temple and paintings in it were noticed in the early 20th century by S.Radhakrishna Iyer, local historian and he described this wonderful discovery in a book devoted to interesting sites of his region. Wider scientific community though learned about frescoes later, after 1920. 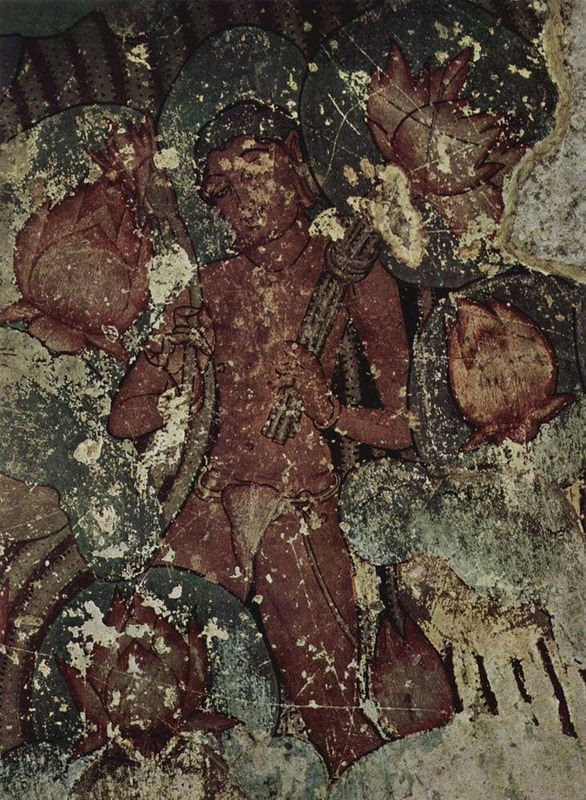 Most paintings are made in Pandyan period – the 9th century AD. Central and most important drawing is a pond with lotuses, flowers in the pond are collected by monks, ducks, swans, fishes, and animals in the pond. This scene shows Samava-sarana – important scene in Jain religion. Samava-sarvana is special, beautiful audience hall where Tirthankaras (great liberated souls in Jain religion) delivered sermons after they reached realization (kevala-gnana). Bulls, elephants, apsaras, and gods gathered in this audience hall to witness this grand scene. Other paintings are floral patterns. Tops of columns contain drawings of drawings of dancing women (apsaras) with lotuses. One of the pillars contains also a drawing of the couple. These drawings have been carried out with outstanding talent. Southern pillar contains drawings of king and queen with an umbrella over them. Most likely the colors initially were vivid, now they are more grey. The technique of the drawing shows well-developed style in art. India has a long tradition of painting on the rock with many Neolithic and later paintings in natural caves. Walls of Sittanavasal Cave are not very even and thus the plaster has different thickness – from 1 to 8 mm. The first layer of plaster contains coarse sand, second is finer – this is similar to the technique of European frescoes. The pigment was mixed with the lime and possibly some gum (in the black pigment) as well. The color was put on dry plaster. It adhered to the plaster extremely well – persisting more than 1000 years. Medieval artists had deep knowledge (which is lost now) about the natural pigments – colors did not bleach when mixed with lime and very well withstood the test of time. Artists in Sittanavasal have used black, green, yellow, orange, blue and white pigments. Damp air in the cave facilitated the growth of slime consisting of algae and lichen – throughout the centuries it covered the paintings. This slime had to be removed mechanically – with strong brushing in 1942 (Shri S.Paramasivan, K.R.Srinivasan) – happily, paintings withstood this well. Unfortunately the extremely valuable cave paintings have been vandalized. Some of the damage was done by… contemporary artists secretly copying the paintings by laying tracing paper over the ancient paintings and redrawing them. As a result nowadays the paintings are barely visible and even somewhat insignificant. Garbha griham is small square chamber, 3 m wide and deep, with 2.3 m high ceiling. Rear wall contains sculpted images of three figures – possibly two Thirtankaras and acharya. On the ceiling there is carved a wheel – Dharma chakra – wheel of law. Ceiling also contains frescoes – intricate carpet design and also a scene of Samava-sarvana with lotus pond. The small shrine has exceptional, unique echo effect: if one is humming "ohmmm" inaudibly, the room starts echoing in audible frequences. This effect is not happening if one is humming audibly. To the south from Arivar-Koil there are Tamil inscriptions from the 7th – 13th century AD. Written sources mention 7 inscriptions, nowadays 2 could be found. Walls of the cliff at the temple are adorned with few sculpted Jain Thirtankaras. In the front of Arivar-Koil in the rock floor there are several holes – some 15 cm wide and 20 cm deep. Possibly these were used to grind the pigments. Between Eladipattam and Arivar-Koil, on the eastern slope of rock there is exciting monument – Navach-chunai (Jambunatha’s Cave), small rock-cut temple submerged in a small lake. Some skills in climbing are required to reach it. Near the tarn, there grows old jambu tree. This is late Shiva temple with a lingam in center. Occasionally, for the worship of temple, the water is removed from the lake. At the western base of the hill there is a shrine of village deities including fine terracotta horses. There are many more ancient monuments around the hill from more ancient past – megalithic burial urns, stone circles, cairns, dolmens, cists from the Iron Age, called mudu-makkal-thaazhi. These monuments are located mainly to the south-west from the hill. S. Theodore Baskaran. Mural techniques. Mural Painting Traditions in India: Content, Conservation & Challenges. 2008. From refined portraits of resplendent maharajas to earthy depictions of divine rogues cavorting with milkmaids, Indian miniature paintings depict the world as it should be: radiant, plentiful and passionate. These manuscript illustrations combine vibrant color with exquisite delicacy, offering immediate impact while also rewarding lengthy examination. Tamils have a long history starting from the pre-historic period. Retracing their history is facilitated by various sources. One-third of India’s epigraphical sources pertain to Tamil Nadu and one of the dynasties of Tamil Nadu – the Pandyas – had the privilege of continuous rule from third century B.C. to sixteenth century A.D. It is a unique accomplishment in the annals of history, since very few dynasties in the world have reigned for such a long time.